“It is a truth universally acknowledged, that a single man in possession of a good fortune, must be in want of a wife.” –Jane Austen, Pride and Prejudice. Step 2: Stir fry pepper and onions for about 1 minute so they are still crisp and colored. Remove from pan and set aside. 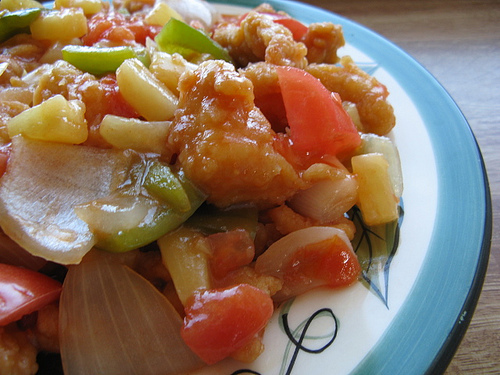 Step 3: Make sweet and sour sauce by mixing vinegar, sugar, salt, orange juice, pineapple juice, and ketchup. Bring to a boil and simmer for 10 minutes. Mix 2 Tablespoons of cornstarch in 1/8 cup of juice and stir in until thickened.